DJ Ollie Mobile Wedding Discos York provides professional wedding entertainment services to make your day both special and memorable, covering York, Leeds, Harrogate and the surrounding areas. We cover all events, such as wedding music, wedding discos, wedding receptions, civil ceremonies, anniversary celebrations and more. DJ Ollie will supply wedding DJs and wedding entertainment, everything from a night disco to a full day package. The Wedding reception and Civil Ceremonies area is by far the fastest growing part of our business. DJ Ollie Mobile Wedding Discos York take great pride in looking after our clients through our professional services from the moment an enquiry is made, right through to the wedding entertainment itself. DJ Ollie Mobile Wedding Discos York has a team of top DJ’s in the York and Leeds area who specialize in wedding music and entertainment. We make sure your wedding gets the right DJ by gathering information from your initial enquiry and listening to your requirements. 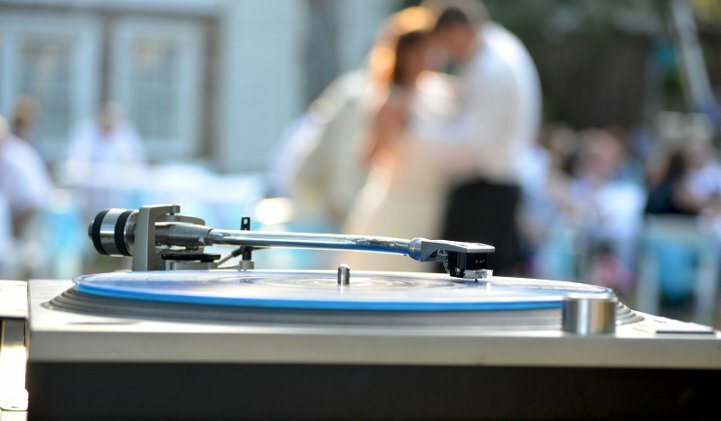 There are several factors to consider when booking a wedding DJ, one being the music itself. We totally appreciate that each bride and groom will have their own views of what to and whatnot to play. With this in mind, you may wish to supply a play list for your wedding in advance allowing our professional DJ’s to build this into your wedding entertainment. Another factor to consider is the wedding’s dress code. Our DJ’s are happy to accommodate a specific dress code from black tie with white shirt, right through to smart-casual clothing. DJ Ollie Mobile Discos are conscious this can range from a total party DJ through to a more relaxed approach. Our York Wedding DJ’s are able to cover all wedding venues across Yorkshire and provide Yorkshire wedding DJ Hire, such as village halls, hotel function rooms, marquees or a prestige halls and castles. DJ Ollie Mobile Wedding Discos York are happy to talk and work with your venue and your wedding coordinator and if required, suppl your Public Liability Insurance (PLI) and Portable Appliance Testing(PAT) paperwork in advance of your event. As your wedding day approaches, we understand you will be very busy making sure everything is going to plan. With this in mind we take time to give you a courtesy call and check all the details. We can upon your request even contact the venue to arrange access and set up as required. DJ Ollie Mobile Wedding Discos York understand that different people have different budgets to work to when booking their wedding entertainment. We have options available depending on your requirements. Other factors such as the size of your wedding venue and the number of guests will need to be considered as well. Help us to help you make the right decision for your special wedding entertainment and provide as much information as possible on our free enquiry form. For more information or for your free quote, please use our contact form,email info@djollie.co.uk or telephone one of our numbers below. One of our representatives will contact you as soon as possible and help you with any requirements and/or questions you may have.